Plans for one of Cumbernauld’s largest annual community events are progressing well as we move closer to the date of this year’s Cumbernauld Gala Day. The event takes place this year on Saturday 27th June at Cumbernauld New Town Hall and, as usual, the festivities will commence with a grand parade from Fleming House to the event venue on North Carbrain Road. This year the Gala Queen, Mara O’Connor, and Princesses, Aily McAdam and Anisa Mian, are from St Maurice’s High School, who take their turn in the annual rotation of local schools, and they recently accepted a £1000 donation from Scottish Water Horizons to support the planning and delivery of the Cumbernauld Gala Day event. Stalls are still available to book, with the booking form available to download here, and all profits from this year’s Cumbernauld Gala Day event will be donated to support the people of Nepal and disaster recovery efforts following the recent earthquakes in the region. The 2015 Cumbernauld Gala Day will take place on Saturday 27th June at Cumbernauld New Town Hall. This year’s theme is “The community that cares” and all profits will be donated to one or more local charities or community organisations. The Gala Queen and Princesses for 2015 will come from St Maurice’s High School. Stall booking is now available by downloading the Stall Booking Form and submitting via e-mail to galaday@cumbernauldcommunityforum.co.uk or by delivery to the LINK Community Facility. Bookings will not be validated until payment is submitted by cash or cheque to the LINK Community Facility. The next meeting of Cumbernauld Community Forum has been moved to Tuesday 17th March at 7pm in Cumbernauld College. This move is to allow as many people as possible to attend the NHS Lanarkshire Public Consultation event, regarding proposed changes to the Out of Hours service, on Tuesday 10th March at 6:50pm in Cumbernauld New Town Hall. We would encourage all local residents to attend this meeting to find out more about the proposed changes and to support our campaign against any reduction in local health services. The 2014 Cumbernauld Community Forum AGM takes place on Tuesday 9th September in Cumbernauld New Town Hall at 7pm, with guest speak Gavin Whitefield CBE, Chief Executive of North Lanarkshire Council. All are welcome to attend. This year has been an eventful year for the Forum, with the many projects which our member groups have been involved in with the Forum. We have been working in partnership with many voluntary groups in the various events which they have been involved with; Reshaping Care For the Elderly, for example, has been helping Senior Citizens Clubs with funding to run activities and healthy exercises; Hope Community Garden Project with their new greenhouse, donated by Sanctuary Housing; the drop in café based in Cornerstone Community Hub; Cumbernauld and Kilsyth Unemployed Workers’ Centre; Cumbernauld Community Memorial Peace Garden, organised by Bobby Johnstone and Scott Campbell of Cumbernauld Environmental Society; Cumbernauld Diabetes Support Group; the management of phases one, two and three of the Town Centre; and, with Colins from VANL, working with me, to help Westfield Senior Citizens secure Lottery funding. This year was the fifth anniversary of our Gala Day – which was held this year on Saturday 21st June, in the New Town Hall, its car park and the car park of the Central Health Centre. The theme for this year’s Gala was for the commemoration of the First World War, which was supported by the Army Reserves, Strathclyde Fire and Rescue Pop Band and many others. The parade took the usual route, from Fleming House, starting with the mounted Police Horses, the Gala Coach and Pipe Band, the Irn-Bru open deck bus, Army vehicles, the YMCA, a North Lanarkshire Council recycling truck, West African Dancers, Scottish Water, the NHS Health Bus, and the Cumbernauld Rotarians –who stewarded the parade. However, a special thanks must be paid to both Frank Clark and Alex Mearns, who worked so hard, as part of the organising committee, to pull together, run and clean-up the Gala Day. One of the most important events that takes place is organising and talking to the school that is going to choose our Gala Queen and Princesses, which is no mean task. This year, I am delighted to thank Greenfaulds High School for choosing the three lovely girls who did the school proud, in their manner and approach towards the general public on the day. Our Gala Queen, Aimee McConville and Princesses, Karen Pullar and Kelsey Russell – who were picked by their fellow pupils – were watched over by Liz McInnes, and they thoroughly enjoyed shopping for their outfits, which were sponsored by Sanctuary Cumbernauld. Thank you ladies, you were all great. A thank you also to Major Shaun Montague, Officer Commanding of 71 Engineer Regiment, who crowned Queen, Aimee McConville, this year. To finish, it is always important to thank our main sponsors who, without them, the Gala Day would not take place. These include the Cumbernauld News, for all their publicity, North Lanarkshire Council, NHS Lanarkshire, Scottish Water Horizons, Sanctuary Cumberanuld, Tesco Cumbernauld Extra, AG Barr, New College Lanarkshire – Cumbernauld Campus; and, last but not least, the people of Cumbernauld. I would like to add a special thanks to my Executive Committee, Iain Sinclair, John King and Kirsty Murray. However, a special thanks must be paid to Rosalyn Griffith, North Lanarkshire Council Community Engagement Officer, who – behind the scenes – keeps everything together, and without her help, many of us (including myself) wouldn’t know where we are. And, finally, I would like to thank Scott Campbell, who put this report together on such short notice. Well it’s all over for another year. The fifth Cumbernauld Community Forum Gala Day was an unprecedented sucess and saw the biggest and best Gala Day event ever, held on a sunny Saturday 21st June at Cumbernauld New Town Hall. Our thanks to everyone who came along and made the day the fantastic community event it could be. Our Cumbernauld Gala Day page has been updated with details from the day as well as a picture gallery from the event. Our thanks again to all attendees, stall holders, sponsors, and contributing businesses and organisations, and we hope to see you all again at next year’s Cumbernauld Gala Day. The Organising Committee met for the last time on Monday night and we’re now putting in place the finishing touches for this year’s Cumbernauld Gala Day, taking place at Cumbernauld New Town Hall this Saturday, with the parade leaving Fleming House around 11:15am. More details about what you can look forward to on the big day, including the full schedule for the main stage, is available on the Cumbernauld Gala Day page (link in the menu bar above). Please also follow our new Twitter account @CumbernauldGala to keep up to date. There are still some stalls available for inside the New Town Hall so please submit your Stall Booking Form ASAP and help us to make this the best Cumbernauld Gala Day ever. As plans for this year’s Cumbernauld Gala Day progress, we are now able to launch the stall booking process. The Stall Booking Form can be downloaded by clicking here and hard copies can be collected from the Muirfield Centre and LINK Community Facility, and at the Cumbernauld News office in the Town Centre. Forms can be returned electronically via e-mail to galaday@cumbernauldcommunityforum.co.uk or in person to the LINK Community Facility, for the attention of “Cumbernauld Community Forum”. 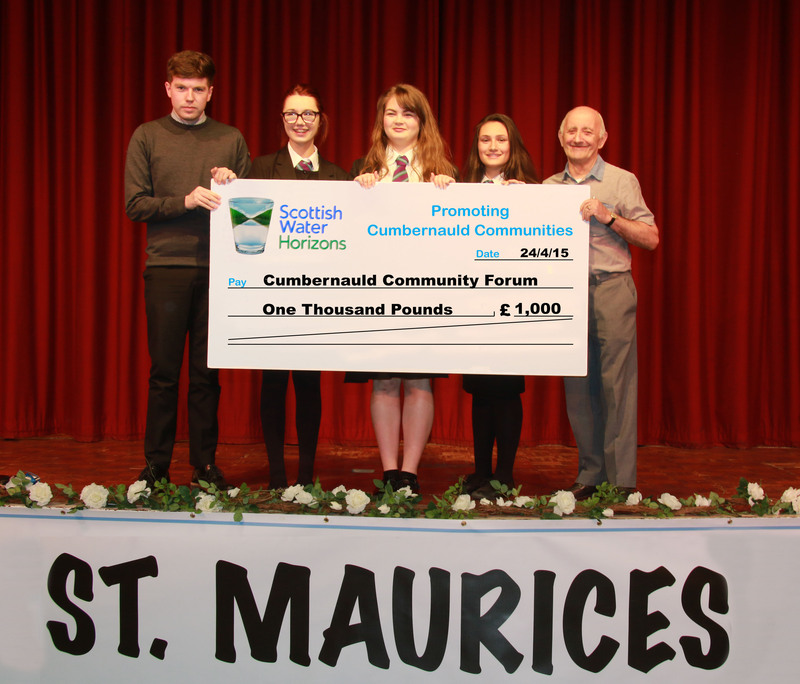 Payment can be made by handing a cash or cheque, in an envelope clearly marked “Cumbernauld Community Forum”, to the LINK Community Facility. Alternatively, for the first time this year, payments can be made by BACS or CHAPS via your own internet banking. All payments made using this method must have a reference number of your organisation name, or your own name if booking as an individual. 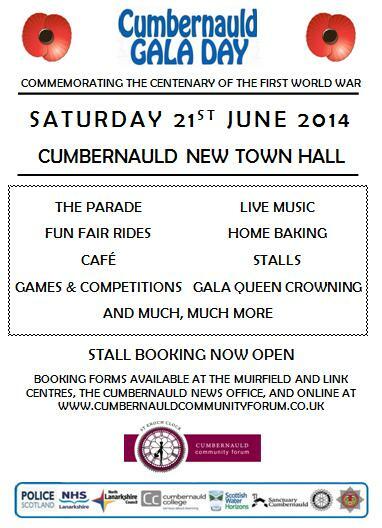 Further details on this year’s Cumbernauld Gala Day will follow in the near future.